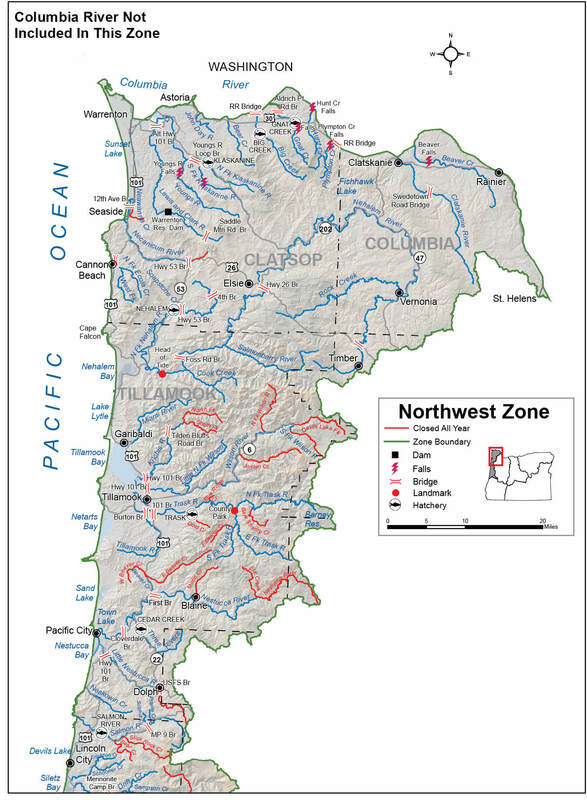 The Northwest Zone is all waters north of the Umpqua River to the Columbia River that drain directly to the Pacific Ocean, not including the Umpqua River drainage, and tributaries of the Columbia River entering downstream of the City of St. Helens. Portions of Columbia River tributaries upstream of the railroad bridge (near the mouth), the Skipanon River upstream of the Harbor Street Bridge, and Youngs Bay upstream from the Highway 101 Bridge are included in the Northwest Zone and those portions of the tributaries other than Youngs Bay below the railroad bridge (near the mouth) are included in the Columbia River Zone Regulations & Map. Regulations for marine fish, marine shellfish and marine invertebrates are listed under the Marine Zone Regulations. Angling for all species in streams above tidewater is restricted to artificial flies and lures May 22 – Aug 31. See exceptions for use of bait in Siletz, Little Nestucca, Nestucca, Trask, Wilson, John Day, Lewis and Clark, Youngs and Klaskanine rivers, Big and Gnat creeks, and Three Rivers. Use of bait allowed in bays and tidewaters year round. Anglers may not continue to angle for jack salmon or trout after retaining a limit of adult salmon or steelhead. See marine zone for additional regulations that apply to coastal bays. Multi-species restrictions: It is unlawful for any person to fish for, or take and retain, any species of salmon, Pacific halibut, or marine fish while possessing on board any fish not allowed to be taken in the area at that time. No more than 2 wild adult Chinook salmon per day and 10 per year may be harvested in the north coast bays and streams from the Necanicum River to the Salmon River. Of these 10 wild adult Chinook salmon, no more than 5 may be harvested from the Nehalem River and Bay and/or North Fork Nehalem River from Apr 1 – Sep 15. Streams: (including tidewaters and bays): 2 per day, 3 daily limits in possession. Angling restricted to artificial flies and lures in streams above tidewater, May 22 – Aug 31. See Exceptions where use of bait is allowed. Rainbow trout over 16 inches are considered steelhead in streams. Salmon and Steelhead In the aggregate: 2 adult salmon or steelhead per day, 20 per year. 5 jack salmon per day, 2 daily jack limits in possession. 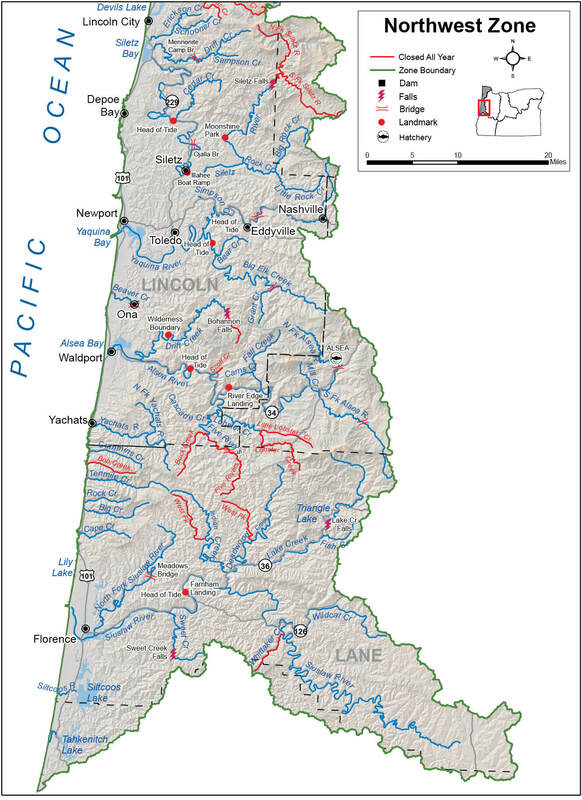 See exceptions to the Chinook salmon catch limit under north coast streams (Necanicum to Salmon) and Yachats River. Pink salmon, sockeye salmon, hatchery coho salmon, and hatchery steelhead may be retained as part of the adult and jack salmon daily bag limit in all waters that are currently open to angling for Chinook salmon or steelhead, except as specified in Exceptions. Hatchery releases of coho salmon occur in the Trask River, North Fork Nehalem River, Big Creek, Klaskanine River and Youngs Bay. Closed to angling for chum salmon (including jacks) unless noted under Exceptions. Angling restricted to artificial flies and lures in streams above tidewater May 22 – Aug 31. See Exceptions where use of bait is allowed. See Exceptions in NW Zone to determine where harvest of any Chinook salmon is allowed. Harvest of wild steelhead and wild coho salmon is prohibited in the NW Zone except as allowed under Exceptions for wild steelhead in Big Elk Creek, Salmon River, and wild coho in Siltcoos Lake and Tahkenitch Lake. There is no annual limit on hatchery salmon or hatchery steelhead as long as the appropriate number of Hatchery Harvest Tags have been purchased to record the catch. Closed unless noted under Exceptions. myodfw.com. Check before you fish. Closed to the retention of white and green sturgeon. All sturgeon must be immediately released unharmed into the water. Sturgeon over 54 inches in fork length cannot be removed totally or in part from the water. Only one single-point barbless hook may be used for sturgeon. Note: Tidewater portions of Columbia River tributaries are managed per Columbia River regulations. Columbia River sturgeon fisheries downstream of Bonneville Dam are restricted to catch-and-release angling only. Streams: (including tidewaters and bays): Open during trout, salmon or steelhead seasons. Streams: (including tidewaters and bays): Open during trout, salmon or steelhead seasons, except tidewater areas of Columbia River tributaries downstream from the city of St. Helens are open all year. Bluegill, Catfish, Crappie, Other Sunfish, Walleye, Yellow Perch, Striped Bass, Sucker, Northern Pikeminnow, Carp, Chub, Sculpin and other Nongame Fish and Shad No limit. Marine Fish and Marine Shellfish See Marine Zone Regulations. For smelt species other than Eulachon smelt, see Marine Zone Regulations for allowed Harvest Methods and other Restrictions. An angling license is required. Daily bag limit of one wild coho salmon and one wild coho jack per day. No more than 5 wild adult coho salmon may be harvested per year in the Northwest and Southwest Zones with open wild coho salmon fisheries. All 5 may be harvested from Siltcoos Lake, Tahkenitch Lake, and/or Tenmile Lakes or as part of the aggregate with other open wild coho salmon fisheries in the Northwest and Southwest streams and lakes. Wild coho salmon seasons are determined annually, prior to September; please check odfw.com for information on wild coho seasons.